I took the photo below on our 2003 trip to Paris. I could not for the life of me figure out how these cars either got into their parking spots or, how they were going to get out? While getting ready for our up coming trip this April 2014 back to Paris, I have been reading a lot of Paris ebooks. 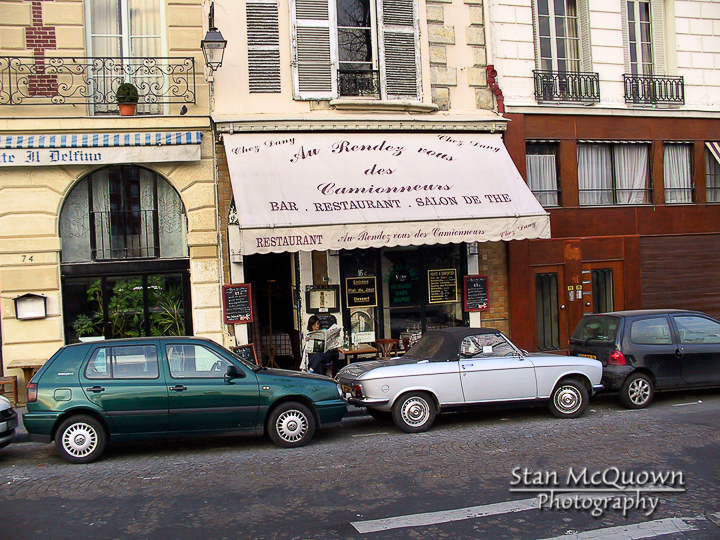 I finally came across my 2003 answer to this photo, it is explained by the British writer Vernon Colman in his Kindle Edition ebook Secrets of Paris for Beginners: An Insider’s Guide… “French drivers tend to park their cars where they happen to stop. Since there are rarely any suitable parking spaces in the city centre this means that they simply park on the first pedestrian crossing they come to, leaving pedestrians with the choice of either squeezing between two sets of bumpers or climbing over the car bonnet. While sitting in cafés we love watching Parisians park their cars. It’s great fun. In most countries, if a driver comes along in a fifteen foot long car and finds a fourteen foot long space he will probably look at the space for a moment, curse loudly and then drive on. The British motorist looks for a space into which his car will fit. This isn’t the French way. In Paris the driver makes the space fit his car, rather than the other way round. He will simply reverse into the space as hard as he can and bump the car behind back as far as it will go. This will usually mean that the car he has backed into will be shunted into the car behind it. And so on and so on. The driver will then nudge the car at the front of the space he wants to get into. And eventually he will get a fifteen foot long car into a fourteen foot space which he has turned into a fifteen and a half foot long space. The fun is repeated when a driver of one of the cars which has been shunted comes along and wants to move his car. Usually, if a driver finds that he is sandwiched in by two cars whose bumpers touch his then he will probably jump up and down and start tearing out hair. In Paris the driver simply jumps into his car and reverses into the car behind and then shunts into the car in front until he has created enough space to enable him to drive out into the traffic. He will, of course, do this without signalling because signalling is cissy and not something the French do unless they intend to drive in a dead straight line and want to confuse the motorist travelling behind them.